When you think about design or remodel your kitchen, don’t forget an important element to enhance your kitchen look, that it is the kitchen accents. You need to choose the proper accents, for accents there are many styles designs and materials but the most beautiful and functional ones are the copper accents, You may ask why should I select the copper accent; however there are many others materials with various designs?! The reason behind choosing this material is very simple; the copper accents are elegant, popular and functional with variety of shapes, designs and colors. 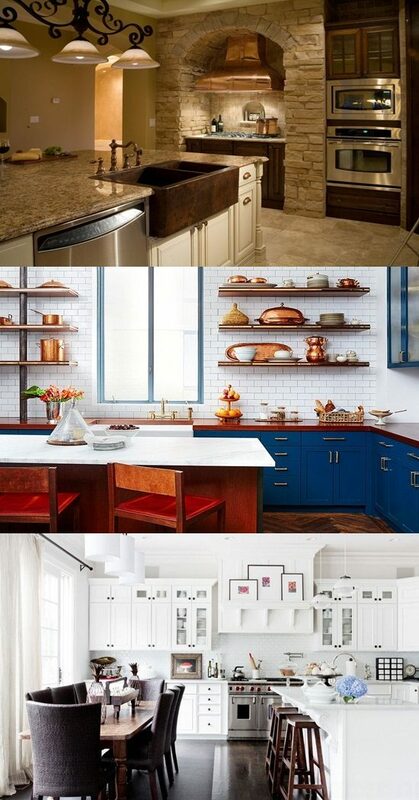 The kitchen copper accents are many including copper cabinet knobs, sinks, faucet, etc. The copper cabinet knobs are very attractive and have a popular stylish look. Moreover they are durable and can last for a long time. They have also variety of shapes, sizes and finishes so they can match any decor and fit your needs. The best thing about buying copper knobs you can find them easily online with numerous selections and sometimes also with good price. The copper sink is a very excellent choice, not only because the copper sink adds a glorious look but also it enhances the decorative value of your kitchen. The copper sink manufacturers care about designing it with different colors and styles, and they don’t forget also to develop its durability and functionality. The copper sinks are very beautiful and elegant because they are handcrafted, hammered, shaped with beautiful and unique design, to fit every taste and match your kitchen style. It has also extra benefit that it is easily cleaned; you don’t need to clean it with much effort, just with simple ways it will be cleaned not like the other metal sinks. Anyway we have to add more emphasis that copper finishes and accessories are not just a beautiful supplement but they good investment for you because of their variety, durability and also the good price available in the stores or online.